US ambassador to the United Nations Samantha Power (2nd R) speaks with other UN Security Council ambassadors on January 22, 2016 during a meetying with the Burundian President at his residence outside Bujumbura. The U.N. Security Council departed Africa on Saturday, considering its options to help quell political violence in Burundi. Council members had a disappointing meeting with President Pierre Nkurunziza on Friday, in which he showed no sign of softening his rejection of an African Union peacekeeping force or engaging in a substantive and inclusive dialogue with the opposition. “The African Union has to work through what its next move is, now that the force it authorized is rejected,” the U.S. ambassador to the United Nations, Samantha Power, told reporters after meeting with the AU Peace and Security Council for more than two hours Saturday here in Ethiopia’s capital. African heads of state will hold their annual summit next week, and diplomats said they would be watching to see what comes out of the gathering. 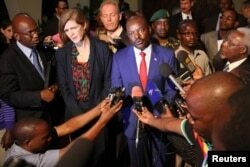 Samantha Power, the United States' U.N. ambassador, and Burundian President Pierre Nkurunziza speak to reporters in Gitega, Burundi, Jan. 22, 2016. 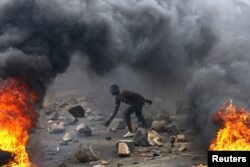 Last month the African Union announced it would deploy a 5,000-strong “prevention and protection” force to Burundi, in response to election-related violence that has killed at least 439 people since April and caused 220,000 others to flee the country amid growing human rights violations. Nkurunziza has rejected the AU proposal, however, and the peacekeeping plan is stalled. The AU also authorized sending 100 human-rights observers to Burundi, but so far only 10 have arrived in Bujumbura, the capital. Members of the rights team are camped out in a hotel, unable to begin work because a memorandum of understanding with the government has not yet been agreed. As reports of abuses grow, so do doubts that the contingent is adequate in size to do its work effectively. 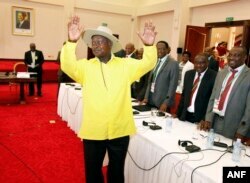 In July, the East African Community (EAC) regional bloc appointed Ugandan President Yoweri Museveni to mediate an inclusive dialogue between the Burundian government and opposition. FILE - Ugandan President, Yoweri Museveni, center, gestures to delegates attending the Burundi peace talks, at Entebbe State House about 42 kilometers east of Uganda capital Kampala, Dec. 28, 2015. Some diplomats have expressed frustration with Museveni’s lack of progress in getting the parties to the table, in part because he is preoccupied with his own re-election campaign. Burundi’s political crisis began in April, when President Nkurunziza announced he would run for a third term despite a constitutional limit of two terms for the head of state. Critics said Nkurunziza, a former Hutu rebel, also was violating the peace agreement that ended 12 years of civil war between Burundi’s Hutu majority and its Tutsi minority. Violent clashes soon erupted between protesters and forces loyal to the ruling party. A failed coup d'etat escalated the violence in May, as large numbers of Burundians left the country. FILE - A protester sets up a barricade during a protest against Burundi President Pierre Nkurunziza and his bid for a third term in Bujumbura, Burundi, May 22, 2015. Nkurunziza carried on with his re-election plan and won what was described as a landslide victory in July, but the violence has continued. The U.N. secretary-general has appointed a special adviser on Burundi, Jamal Benomar, and with the council’s approval he has been assembling a team to expand the U.N.’s political presence in Bujumbura. 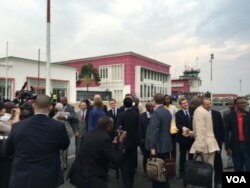 This week’s two-day visit is the second time the Security Council has come to see the situation in Burundi in less than a year, a clear indication of its growing concern. As the envoys head back to New York, they will consider the council’s options in light of what they have seen and heard in their meetings with the president, political parties, civil society, religious leaders and independent media. Some council members have expressed support for the proposed AU force, hoping it can help stabilize the country and foster a climate for dialogue. Others, like Russia’s deputy ambassador Petr Iliichev, say violent clashes have taken place only in three or four neighborhoods in the capital, making a police force a good option. “If we have trainers that are going to upgrade not only the skills of policemen and the perception of what’s required — human rights, due process — then we are going to improve the situation,” he said. Egyptian ambassador Amr Aboulatta recommends an incremental approach. “You begin step by step: begin by observers, and then police force and then full force,” he said. Whatever the Council’s ultimate decision, it could have repercussions, not only for Burundi but for the wider region.